Middle Eastern cities are often criticized for adopting derivative, western modern architecture rather than defining their own identity. This would be a fair criticism of much of Dubai, but the telecommunications headquarters building and radio tower by Canadian architect Arthur Erickson is a prominent exception. Based in British Columbia, Erickson is a surprisingly rootless architect who had traveled in the Middle East since the 1950s and created a variety of original glass-and-concrete geometries around the world with remarkably little constraint of a consistent house style. As Erickson himself describes it, "I am fortunate that I can stand in Canada, a country without a culture, and look at the world. When I am given a project... I can say, "What is its essence? How can I extract something pertinent for today?" While his fellow Canadians may not appreciate his turn of phrase, they do appreciate the architect behind it. 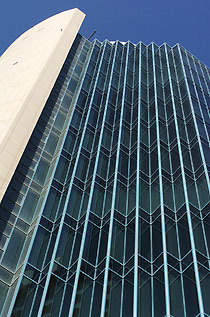 The Dubai tower owes most in form to an unbuilt design of Erickson's for the Christ Church Cathedral in Vancouver in 1973, which included a steel and glass tower with a similar geometry of glass prism at the top. 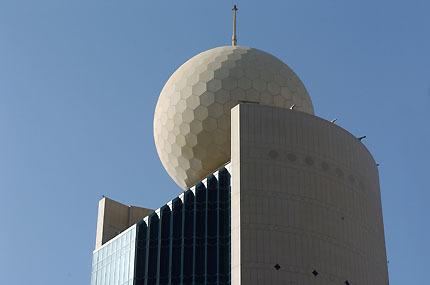 In Dubai the sloping glass sets off the distinctive radome "golf ball" containing Etisalat's radio antennas. 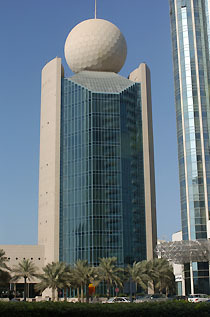 Erickson designed another office building and tower for Etisalat in Abu Dhabi at the same time, in the same style with matching "golf ball", and others have been added in other Emirates later. The "golf ball" towers, illuminated with a mesh of discrete white lights a night, have become a symbol of Etisalat in the UAE. 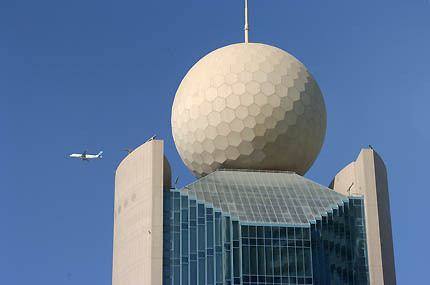 A second, taller Etisalat building has recently been built in Dubai, near the Emirates Towers, again with the signature golf ball. The materials from Erickson's original designs – the dark glass with green glazing, and reddish stone cladding – is used consistently across many different styles of Etisalat building around the UAE, as a form of branded architecture. The Etisalat Tower in Dubai is on Baniyas Road in Deira, on the northeast side of the Creek, across the road from the Sheraton Dubai Creek hotel. The entrance foyer is open to the public as the main Dubai service office of Etisalat, the telecommunications provider in the UAE. While visiting, cross the road to the National Bank of Dubai headquarters opposite, by Carlos Ott. There is a promenade along the Creek, from the nearby dhow wharfage towards the Gulf, that passes by the National Bank of Dubai building and provides a good view of the Etisalat building. For more information from Etisalat please call +971 4 222 8111. Arthur Erickson provides more details about his Etisalat towers at his web site at www.arthurerickson.com.